During the last Easter holiday, I was feeling a bit tired and lazy after a few weeks of entertaining the kids at home. There’s only so much magic I can create within 1300 square feet and a tiny garden, and after a few days of it, we all need something a bit fresher than what I can conjure. When Tyler had to take a group to the V&A for a guided lecture, I hopped on the (literal) train to bring the kids. We got there, said goodbye to him for the next two hours and then I promptly walked up to the information desk as I had, literally, done no research ahead of time of what might be on. So off we trotted to the Sackler Centre and there a kind lady at the desk told us all about the family backpacks. I was a bit confused what a family backpack was and then she explained that they had different contents depending on which theme you chose and the contents were little activities to do around the museum. Perfect! We got a little list of all the themes available and Viola opted for China. (Which I thought was a bit random because I didn’t realise she knew about China… but then she told me she chose it because her friend Jamie at school was from China and told her all about Chinese New Year. How cute!) We took our bag and headed back through the museum to the China section. When we got there, we followed the little map around the area and then pulled out our corresponding bag for the activity there. We found a little wooden pillow in one of the bags and went to try sleeping on in in the middle of the bench inside the room, as the card instructed. Each little activity let us play around and the kids experience what they were seeing in such a better way. We worked our way through all the activities by building, drawing, laying, looking… it was fun and we didn’t feel in the way at all. By the end of the six little bags, attention was running thin so we headed out to the cafe and regrouped. Well, I regrouped. Harrison and Viola ran around and got their shoes/socks wet by running in the fountain…. Which was, obviously, only fun for about 5 minutes. Then it was not fun because they were pretty cold so it was time to leave. Ha! But I loved seeing the museum through their eyes. Would I have picked those particular things to see and learn about on my own? Probably not. I’m grateful for smart museums to help families enjoy these spaces together. I can easily entertain myself in the V&A for hours, but I was feeling daunted by the idea of having to keep them happy. Take a peek on the V&A Museum’s official page for activities they offer to families. The “Backpacks” activity is just one of many events for families to participate in. 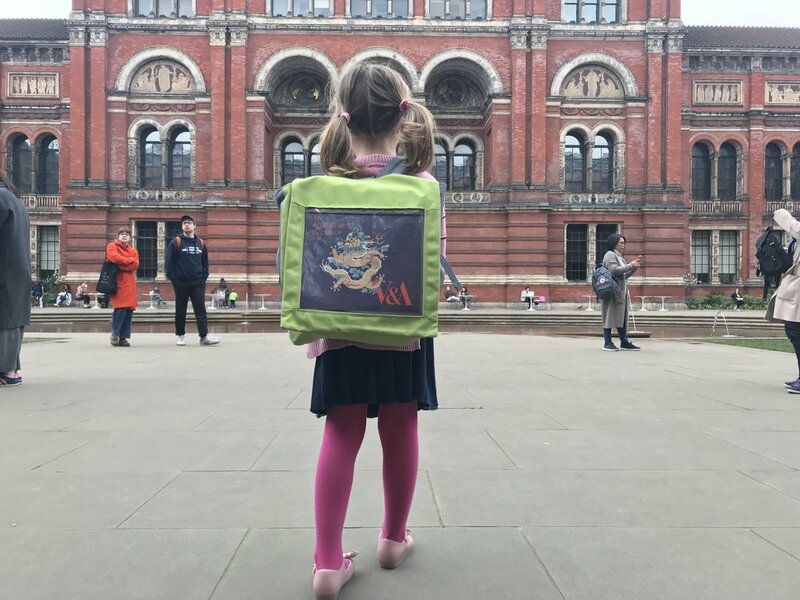 The V&A does a wonderful job in offering many other activities, such as trails, family games, hands-on discovery areas, and pop-up performances. (You’ll probably benefit from doing a bit more planning than I did!) Keep in mind that some of these activities are temporary, so be sure to check the website for an updated calendar of the events they are offering before you go. Also, I love this picture of me and Viola at the V&A. It was the day before Harrison was born, and I’ll always remember that last little “us” outing to splash around at the V&A in the hot May sun. Getting out and exploring a museum is such a fun way to spend a free afternoon with your kids. It doesn’t matter if you’re just visiting for a few days or have lived here for years. It’s a win-win: they will be having fun and learning, and you will, too. Upon arrival to the V&A, just take a wander on back to the Sackler Centre Reception. They will point you in the right direction for all of the daily activities. Looking for more ideas of what to do in London with kids? Look at my Little London section.